Henderson Lake it takes its name from David Henderson, one of the founders of the Adirondack Iron Works, all the way back in 1826. 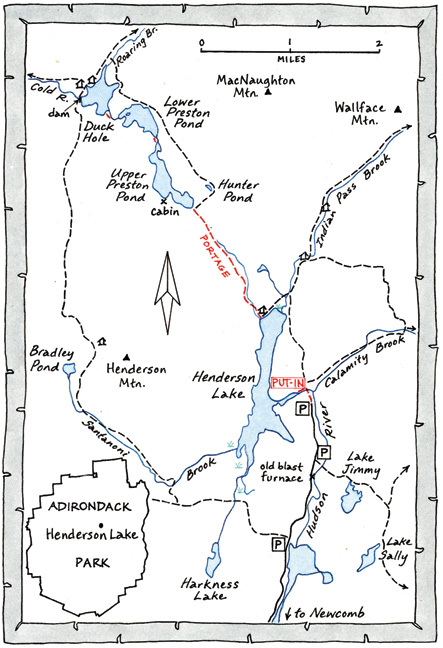 The Adirondack Iron Works mined iron ore just south of Henderson Lake from 1827-1857. At the peak of its operations the company employed about 400 men who lived in the (now ghost town) of Adriondac. A giant blast furnace still stands as the most durable of Adirondac’s remnants. 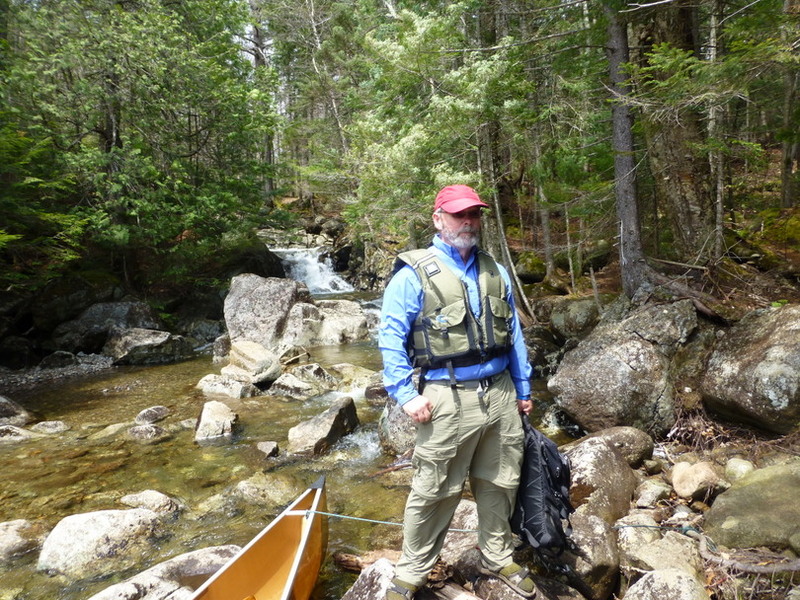 After the Adirondack Iron Works company closed the area was leased to the private Adirondack Club (then changed to the Tahawus Club) for their fishing and hunting use. With the coming of World War II the need for titanium dioxide caused the federal government to reopen the mine. A railroad was built into the area and National Lead Industries moved in creating the company town of Tahawus in the process. National Lead ran the mine until 1989, when it again closed down..
From Newcomb head north towards the Upper Works trailhead at the end of County Route 25 . The road parallels the Hudson River as it passes the abandoned NL mine, an eighteenth-century blast furnace, and the ruins of Adirondac, once a bustling mining settlement. 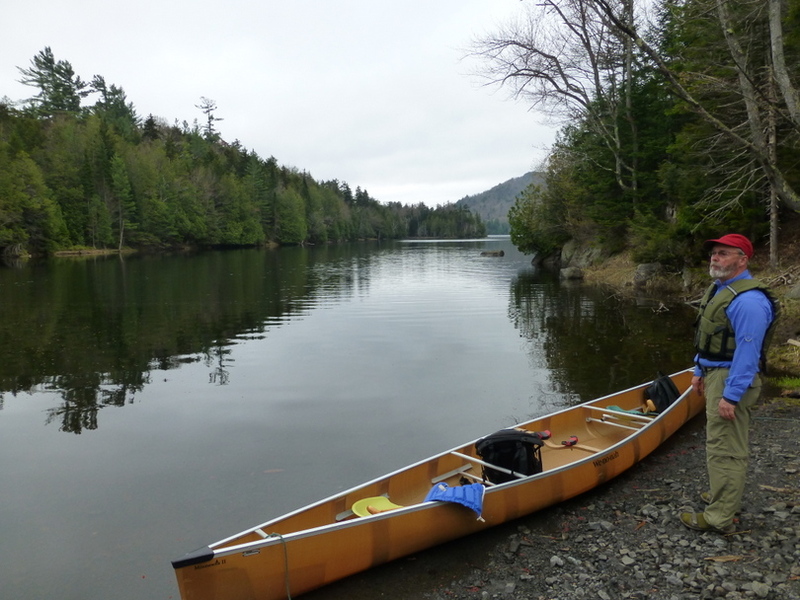 The trailhead parking area is used by paddlers and hikers who access the trailheads to several peaks in that area. 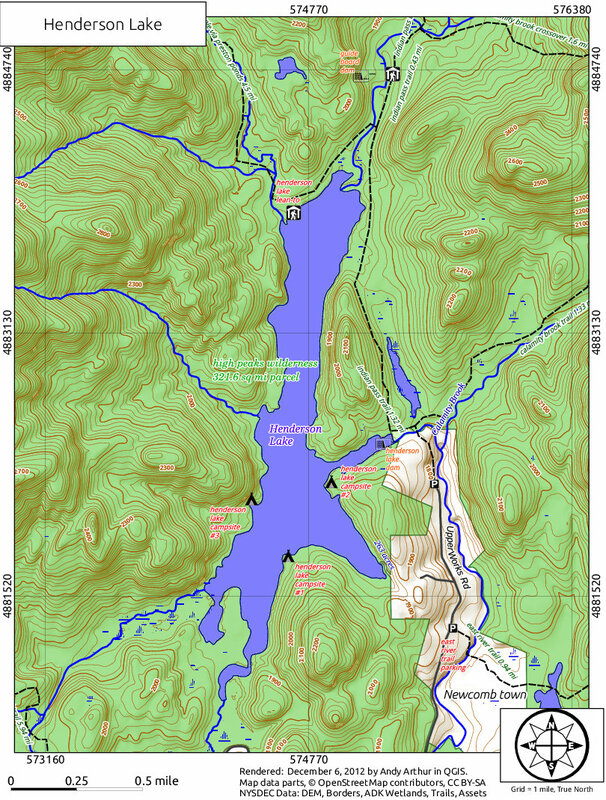 It is a half-mile portage along the south flowing Hudson River into Henderson Lake on a gravel path that is suitable for large wheeled carts. At the top of a small knoll you’ll come to the put-in on Henderson Lake. It’s at the south end of a cove that leads out to the main portion of the lake. The put-in is next to a large berm that impounds the lake. The concrete spillway marks where the Hudson begins its 306-mile journey to the Atlantic Ocean. It was cloudy above the High Peaks but we were able to see a vista that includes MacNaughton Mountain, Wallface, Mount Marshall, Colden (4,714) , Mount Adams, the North River Mountains and 4,607-foot summit of Santanoni Peak. There were ice chunks along the cliff lined shores. 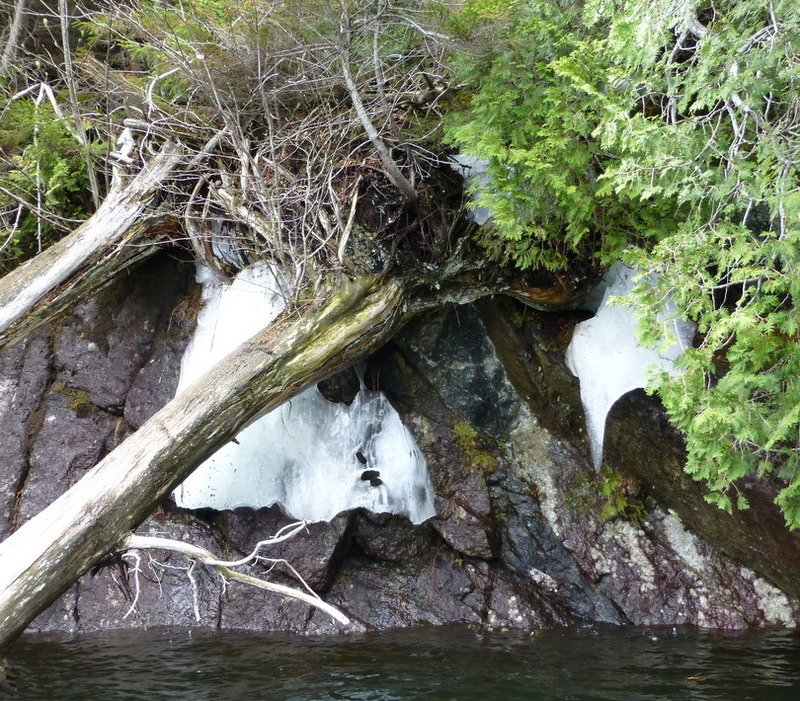 A small waterfall on the north end adjacent to the lean-to.